There are two important times of year for pool owners: when the warmer weather comes out, and it’s time to open the pool; and when the temperature starts to cool off after summer, and it’s time to close the pool. 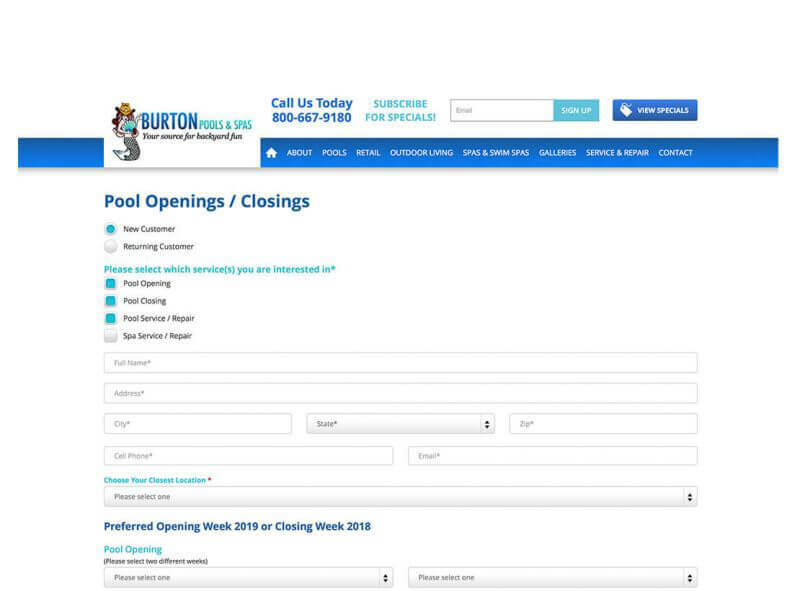 Make it easier for your customers to schedule their pool opening and closing for the season with our online Pool Opening & Closing Form. Allow your customer to reach out to you when it’s convenient to them when they sign up to open and close their pools directly on your website with our easy-to-use form. Increase Services. Offer customers ongoing pool and spa services. More Money. Provide additional revenue stream to your business. Better Customer Service. Make it easy for your customer to use your service. Our Pool Opening & Closing Forms work best for any pool construction or pool service company owners needing an online format to have customers sign up for pool opening and closing services.